Everyday is a struggle to decide what to make for dinner, I am sure so many of you feel that way! We often play the “What do you want for dinner?” game. Always, when trying to choose what to cook it’s not just about taste; it’s about what will actually get eaten by a toddler and my husband. Knowing all of this, the other day I had an epiphany = make fried rice, and boy am I glad I did. Talk about a meal that is delicious, gets finished by lunchtime the next day and has a veggie in it, yes please! I know we will be keeping this in our regular rotation, in fact I made it about 3 days later with shrimp and scallops per the hubs request and it was just as well received. I hope you’ll enjoy this as much as we do! In a large non-stick skillet place 1 Tbs of cooking oil and the chicken and saute over medium heat until cooked, set aside. In the same skillet and 1 Tbs of cooking oil and the garlic and cook for 1 minute, add the peas and cook for 1 minute, set aside. Add the remaining cooking oil and the rice; cook for 2-3 minutes. Add the soy sauce, honey, chicken, pea and garlic mixture and cook for 4-5 minutes until well combined. Garnish with the fried egg and serve warm. I love fried rice! And woah shrimp and scallops sound amazing for this recipe 😀 Delicious post. Hibachi fried rice is the best, but when you don’t live close to any this recipe is definitely a good alternative! Congratulations! You really deserve it! So sweet of you ladies 🙂 thank you! 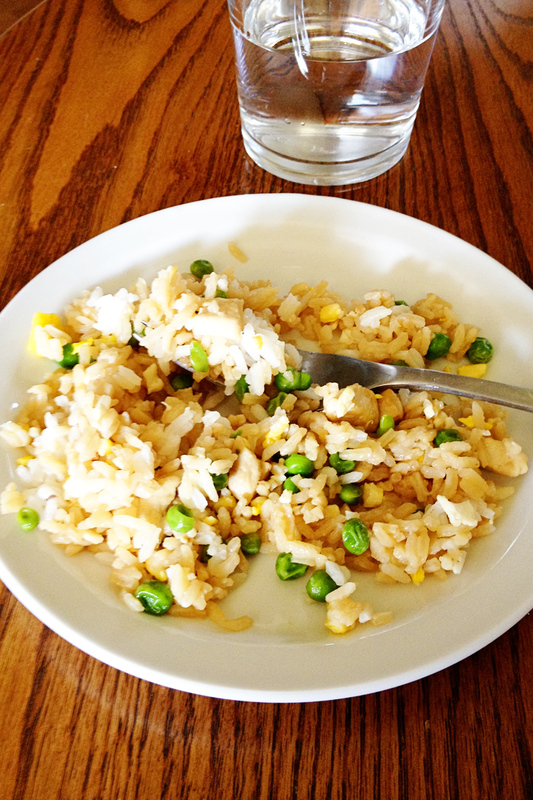 Chicken Fried Rice is one of my favorite meals! Thank you for sharing at All my Bloggy Friends. Wishing you a Happy New Year!